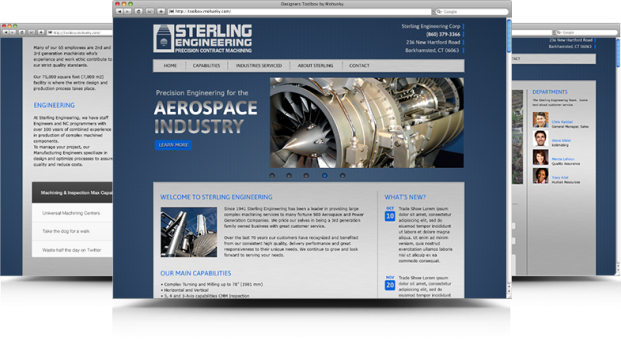 Sterling engineering is a woman-owned small business with clients in aerospace, heavy industry, and power generation. 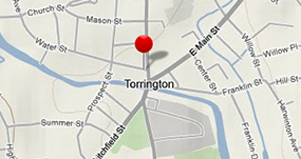 As a small business located in Connecticut, Sterling Engineering has an impressive list of international clients which include the Giants of the aerospace and commercial machinery industry. We were approached by Sterling to get their Website up-to-date and redesigned so they could reflect their international corporate client base. They are among the top engineering firms in Connecticut and wanted a corporate look to suit their company’s image. A major setback for Sterling is that their Webmaster was doing a fine job but worked remotely, so that some of the changes that needed to be done on their Website could not always be made immediately - which posed a dilemma. They also wanted to be able to present their new machinery and services to potential clients, and implement an open communications strategy to reflect their corporate standards. We designed a content-rich website with a clean corporate look. The new website made them stand-out from their competitors. Since the new launch, we also maintain their Site. We added SEO services to increase and maintain their daily footprints In addition, we provided graphic design, marketing collateral and web-programming solutions for the new Sterling Engineering Website and created a Content Management System (CMS) to enable them to edit their content in-house and made them not rely on a Webmaster.